---The Device has been tested and restored to full function, factory standard condition ---PLEASE KEEP IN MIND THAT THIS ITEM IS USED AND MIGHT HAVE A HEAVILY SCRATCHED SCREEN OR BACK. ---Please note you cannot choose exactly which tablet you will receive, their condition varies and you will be getting a random tablet in similar condition to the tablets in the pictures. ---You will receive one Insignia Flex 10.1" 32GB similar to the one in the pictures. 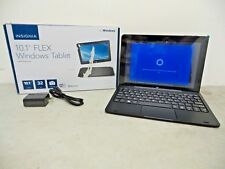 ---Included: Insignia Flex 10.1" 32GB ---Not Included: Original box, charger, and any additional accessories that may come along with the tablet. TESTED AND CHECKED. FULLY FUNCTIONAL AND WORKING CONDITION. REFER THE PICTURE. Insignia Flex Tablet 32GB, Wi-Fi, 10.1in - White & Silver; 1 GB RAM; extras! This is a very decent Insignia Flex Tablet with a nice, big 10.1in screen that is free of any flaws as shown in the photos. This would allow you to connect it to a larger screen. TESTED AND CHECKED. FULLY FUNCTIONAL AND IN WORKING CONDITION. VISIBLE SIGNS OF USE. REFER THE PICTURE. Insignia flex android 6.0.1 32gb tablet. In perfect condition. Has Android version 6.0.1 installed. It has been reset to factory setting. 11.6" widescreen with 1920 x 1080 resolution. What's included. Trending at $98.00eBay determines this price through a machine learned model of the product's sale prices within the last 90 days. Curl Keeper. At 99Cell we want to make purchasing easy and comfortable as possible. On rare occasions and despite our best efforts, an item might turn out to be defective. We are closed weekends. Brazilian Blowout. Insignia Flex 10.1" 32GB WiFi Tablet Model NS-P10A7100 Android 6.0.1 With Case. Excellent used condition. Always kept in case. Shipped with USPS Priority Mail. ---This tablet was tested and verified to work as intended. Great working condition. ---32GB Internal Storage ---Screen 1920 x 1080 Resolution ---Dual Cameras ---Android Version: 7.0 ---Model Number: NS-P11A8100 ---Minor cosmetic scuffs on bottom or back (Do NOT Affect Use and/or are hardly visible) ---Please note, you will receive a random Insignia tablet that is similar in condition to the one you can see in the pictures. ---Includes: ONE Insignia NS-P11A8100 tablet similar in condition to the ones in the photos and a keyboard. ---Does NOT Include: Original Box, Manual, charger, and or any accessories that may come along with Insignia Tablet. 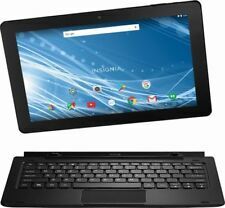 Insignia - 10.1" - Tablet - 32GB - With Keyboard - Black. Insignia Tablet is previously owned and in excellent condition. No scuffs or scratches on the tablet. The tablet has been tested and it works well. It has been reset to factory setting. 16GB Storage (Expandable by optional MicroSD Cards). 16GB internal storage plus microSD card slot:Plenty of space for music, movies, photos, and more. Cloud integration provides a seamless experience across all Android devices. One INSIGNIA NS P10A7100 TABLET. - Item is in the original box. - USB cable. Re-tested and turned out to be fully functional. It may have minor scratches on its screen. Also scratches on back casing. Included: charging cable only. Insignia Flex Tablet (NS-P08A7100) Black - 32GB, N/A, Tablet Only, 8" - Pre-Owned. Extensive internal storage plus microSD slot - Plenty of space for music, movies, photos and more. Moreover, you can expand storage with a microSD or microSDXC card. Manufacturer: Insignia. Learn more › 11.6" widescreen with 1920 x 1080 resolution High pixel density and stunning detail make this screen ideal for Web browsing, studying, reading and streaming HD content. THIS IS AN INSIGNIA 10.1 FLEX TABLET FOR ANDROID MODEL# NS-P10A7100. 32GB BLACK COLOR. THIS ALSO INCLUDES A SOFT RUBBER STAND/COVER WITH A MAGNETIC FLAP. BLACK COLOR. CHARGING CABLE IS ORIGINAL. ---Tested/Certified to Work Perfectly ---32GB Internal Storage ---Screen 1920 x 1080 Resolution ---Dual Cameras ---THE TABLETS HAS A CRACK ON THE TOP LEFT CORNER OF THE SCREEN AND MAY ALSO HAVE SOME COSMETIC SCUFFS AND/OR SCRATCHES (Do NOT Affect Use) *VIEW PHOTOS* ---Includes: ONE Insignia tablet and keyboard. ---Does NOT Include: Charger, Original Box, Manual, and or any accessories that may come along with Insignia Tablet. ITEM: Insignia tablet. INCLUDES: Tablet, keyboard and power adapter. 32GB internal storage plus microSD slot. Tablet has been tested and is in fully functional order. 10.1" screen with 1280 x 800 resolution. For Sale: Insignia Flex ‑ Wi‑Fi -8GB Black ‑ 8" Model: NS 15T8LTE. Insignia FLEX NS-15T8LTE Verizon 8-32GB 4G Wi-Fi LTE Android Tablet Black 8"
Insignia 8" Flex Tablet. Flex NS-15T8LTE tablet enables fast and easy on-the-go Internet access. microSD slot :Allows storage expansion up to 32GB with a compatible card (not included). The model number isNS-15T8LTE. This item is in excellent working order however it will show visible signs of handling. Up for sale is aused, silver, 16GB 8" Insignia Flex. Includes black cover andUSB cable (not pictured ). Tablet is like new; cellophane is still on screen. No noticeable wear. Cover is a little dirty. Insignia Infocast NS-DP8CH 2GB, Wi-Fi, 8in - Black, CHUMBY! Includes the power adapter. Was in service up to a few months ago and is fully functional. 5 out of 5 stars - Insignia Infocast NS-DP8CH 2GB, Wi-Fi, 8in - Black, CHUMBY! 3 product ratings3 product ratings - Insignia Infocast NS-DP8CH 2GB, Wi-Fi, 8in - Black, CHUMBY! Its 1366 x 768 resolution lets you enjoy HD content, and its detachable keyboard syncs automatically to let you start typing quickly. 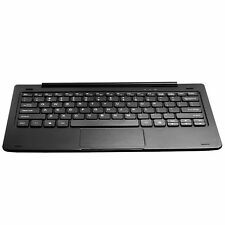 Insignia - 11.6" - Tablet - 32GB - With Keyboard - Black. microSD/SDHC card slot (supports up to 32GB). Up for sale is a pre-owned Insignia Flex Windows 10 Touch screen Tablet NS-P10W8100 10.1" - Black. Good Condition - Insignia Tablet is previously owned and works great - no issues, minor wear from light use. Unpaid cases will automatically be open. We take pride in serving you! Check out our huge selection of diverse products. Wi Fi Internet Connectivity. Clean, bright screen. It is in very good condition and works great. Stream music to Bluetooth speakers and headphones: Bluetooth 4.0 interface enables simple wireless connectivity. The tablet has been reset to factory specs. 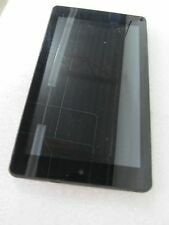 Nearly new Insiginia 10.1 tablet. I just got a newer one and don't need them both. Includes the charging cable, but I don't have the manual. I just reset it back to factory settings so it is as good as new. One INSIGNIA FLEX - 32GB - P11W7100. - Item in the open original box. The item Includes Clean, clear and flawless screen. Open Box item. Insignia 10.1" 32GB Tablet -NS-P10A7100 32GB WiFi Android Black Tablet Grade C.
Condition: Used Description: Great working condition! Tested for full functionality. Cosmetic condition is also good. Items show some regular signs of use like scratches on the back and keyboard; the screen has NO scratches! Tablet comes with the original keyboard and screen protector. Please take a close look at the pictures for more details. Pictures were taken from one of the units you will receive. Please notice that condition varies from one item to another. What's included: Tablet, keyboard What's not included: Charger, printed documentation, other accessories Original box and packaging: Not included. All the pictures are those of the phone. No screen cracks but minor scratches, body in good condition. Screen is very dark, does not appear to be a brightness issue. Choosing a tablet can be daunting. There are many manufacturers and brands available. They operate on a few different systems and have different size screens and capabilities. The first thing to do is think about what you are going to need and use your tablet for. How Are You Going to Use Your Tablet? The way you use your tablet can help you determine what type and size you need. Watching movies, playing games, or streaming online TV: For anyone who downloads movies or enjoys games, look for a model with a larger GHz processor and higher GB storage space. Reading: You can read standard eBooks on most screen sizes. If you are a reader of online magazines and newspaper content a larger sized screen is usually better. Internet browsing: For Google fans, and users of their online apps, look for a table with an Android system, such as those by Insignia tablets. Document creation: For anyone who creates a lot of documents or needs to enter a lot of online data, look for a model that comes with a separate or detachable keyboard. Tablet models with Windows 10 can be ideal for compatibility with spreadsheets etc. Connectivity: For use outside your home, tablets use wireless connectivity and have Wi-Fi. If you like to chat face-to-face look for models with front-facing cameras as well as rear facing. What Features Does This Brand of Tablets Have? Screen sizes: Models range in size from 7 inches to 11. 6 inches. Screen resolutions vary, and include 1024 by 600, 1280 by 800 to 1366 by 760. Cameras: Dual cameras so you can take photos and use for communicating face to face. Storage: Internal storage ranges from 8GB to GB with optional slots for USB sticks and connections. Processors: Their models have dual-core or quad-core processors to give you fast performance. Connectivity: Connectivity is via Wi-Fi; some models have USB ports to connect accessories or to other devices. Sleeves: These are available for the different sizes to protect your tablet while in transit. Convertible folio cases: These have elastic on the corners to allow you to prop your laptop up securely on a stand for viewing vertically or at a slight angle. Stylus Pens: These are handy to navigate around the touchscreen quickly or use with apps that you can write directly into. Other Models: Some of the previous models that are not in current production may be available, including the NS-14T004, NS-P16AT08, NS-15AT08, NS-P89W6100, NS-15AT07, NS-13T001, NS-P16AT785HD, NS-P08W7100, NS-P08A7100, NS-15MS08, NS-15AT10, NS-15MS0832, NS-P16AT10, NS-P11W6100, NS-14T002, NS-P10A6100, NS-15T8LTE. Content provided for informational purposes only. eBay is not affiliated with or endorsed by Insignia Products Inc.